My poor son. 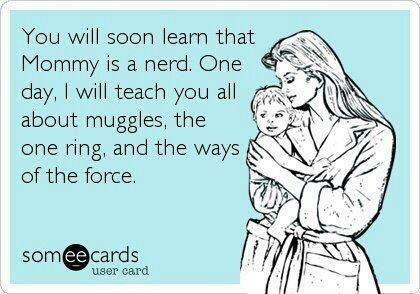 His Mommy is a nerd. Not exactly like this though. I have never gotten into Harry Potter or Lord of the Rings. No my kid has it worse. His Mommy (and Daddy) like video games. As if he doesn’t have enough trouble communicating and relating to his peers. Instead of playing Cars or Spiderman or some other popular show or movie like other kids his age, we dress up and act out video games. Little Link holding the Master Sword. Thanks to Star Ocean and Tales of Vesperia and other JRPGs he thinks “acking” (or “attacking” as grown ups would say) means you touch the enemy with a sword and it turns into a treasure chest. I think we’ll leave it at that as long as we can. Plus, he enjoys (demands) to read the text on the tv while we are playing. He gets to be Yuri, Daddy is Karol, and Mommy is “all the girls”. So we are working reading skills while having fun. Luckily, Daddy is fast on the button when an inappropriate word or concept comes up – Yuri and Rita have potty mouths sometimes. We talked with his teacher and ABA Coordinator about his apparent obsession with games and they assured us this is good for him. As long as he is playing with us it is the same as any imaginative creative play. The time to worry about obsession with video games is when they are closeted in their room alone and playing. Besides, with him he also mixes in Daniel Tiger, Curious George, Veggie Tales, etc. And sometimes mixes them all up to make really creative play, like “Mario Kratt” who apparently is Chris and Martin’s littlest brother. He isn’t influenced by what other kids think think yet, so we are just going to continue to let our Geek Flag fly at this house, for now.